Are you having some troubles that are directly related to your travertine surface, and you need some Travertine Sealers Houston? If you’re unsure of how to make the most out of your discolored or stained surface, you might feel frustration and disappointment in both yourself and your travertine. If you want to find the best solutions in Texas, the TSSPRO Sealant is exactly what you need in your life. Read more to discover the details of what makes our proprietary products perfect for you. Travertine is a very beautiful stone that many Houstonians love to use for their residential and commercial buildings. Also known as Austin stone, it’s a very common choice for indoor floors, landscaping, patios, and walkways. If you’re using this for residential purposes, you may be trying to upgrade your fireplace or your favorite accent wall. This is usually found in a natural beige hue, but there are many different options for those who want something that stands out. This is a natural limestone that’s commonly found very close to mineral springs. It’s a great option that can play many different roles, but it’s important to remember that it can be very vulnerable. You’re going to have to maintain it and take proper care of it to get the most value and life out of the stone. Because this is a somewhat porous material, you’re going to have to be careful and avoid using most acidic liquids such as bleach and chlorine. Even things such as harsh scrubs, brushes, and heavy patio furniture can cause scratches and leave lasting marks. Do you have travertine tiles that are very stained and discolored? Perhaps you have deep dents and scratches that are very noticeable and you’d like to get rid of them. If so, remember that you’re going to have to eliminate these blemishes before sealing your travertine. This can really cause a lot of problems in the long run, and you’re going to need to pay close to attention to these issues. Before applying Travertine Sealers Houston, make sure you delicately clean your surface by using a soft sponge or cloth. Using abrasive cleaners and chemicals can do lasting damage and cause your stone to undergo further damage. In addition to this, you’re going to have to carefully seal the grout after you’re done cleaning. It’s important to make sure you’ve removed all of the dirt and grime from your surface before applying any type of sealant. Failure to do this will most likely wind up in chaos. You’ll have to deal with further damages and you’ll be sealing in the exact things that are making things worse for you. There are a medley of different solutions and measure you can employ to properly restore your travertine. However, it’s important to remember that every surface is different, and no two are created equal. Because of this, it’s important to make sure you find a professional group who can handle these issues for you. For more information on the best way to navigate these types of situations, call us for details on our TSSPRO Sealant products. We know what it takes to provide our customers with a quality restoration. Count on our professionals so you can experience a solution that works in your favor. 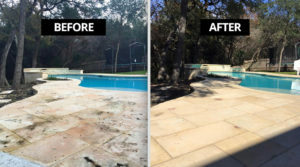 Over the years, our sister company in Texas has been helping customers seal their residential and commercial surfaces in the best way possible. 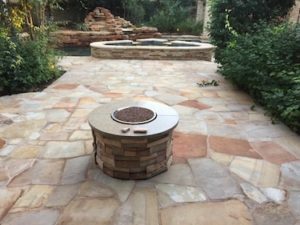 Texas Stone Sealers is a known commodity in this industry, and our services and solutions are always getting better. This was in part inspired by our dissatisfaction with some of the sealants were using in the beginning. We noticed that some of the biggest names in the industry were manufacturing low quality products that didn’t lead to effective sealings. Because of this, we decided to take matters in our own hands. We met with some of the best minds in the business and brainstormed with them to figure out how to develop a proprietary line of sealants. We were sick of dealing with low quality acrylic products, and our entire team felt like our customers deserve better. After working with a lot of different prototypes, we finally figured out something that worked for everyone involved. Today, we are proud to announce our line of TSSPRO Sealants. These are all-natural and alcohol-based products that help you experience a high quality sealing that makes sense for your stones. We’re constantly adding to our inventory, and we’re proud of the product that we’re able to provide our customers with. Make sure you get the most out of your stone by investing in these commercial grade quality sealants. If you’re looking for affordable solutions that don’t compromise quality, this is the right choice for you and your stone. Trust the TSSPRO Sealant for your residential and commercial sealing needs! Finding the right Travertine Sealers Houston solutions can be very difficult, but our professionals hope to make it easier on you. For more information on how we can help, call us at 888-958-0556 to learn more about our services. Our team of experts are ready to provide you with a free consultation that helps you figure out a personalized for your problems. It can be very difficult trying to navigate this on your own, but we’re here to help. Let’s start working towards your travertine restoration today. Houston is one of the biggest cities in all of America. It is also the fourth most populous. We have one of the highest Hispanic populations in the country, and we embrace our diversity. Our citizens make this one of the great places in the world to be, and we couldn’t be happier. If you’re a fan of professionals sports, you’re going to love Houston. Here, you can see some of the greatest athletes in the world perform at their highest abilities. Stop by to see the likes of James Harden and Deshaun Watson dominate their respective sports!